Beautiful modern 1 bedroom apartment within a 6 minute drive or 40 minute walk to the quaint market town of Moraira with it's beautiful and safe beaches. The apartment offers scenic views to the west with outstanding sunsets over the mountains in a very peaceful location. A large swimming pool is open to the residents/visitors. Supermarkets 5 minute walk. Moraira is a small, quiet, upmarket town with good restaurants and plenty of outside eating / drinking. A large Friday Market is a must. 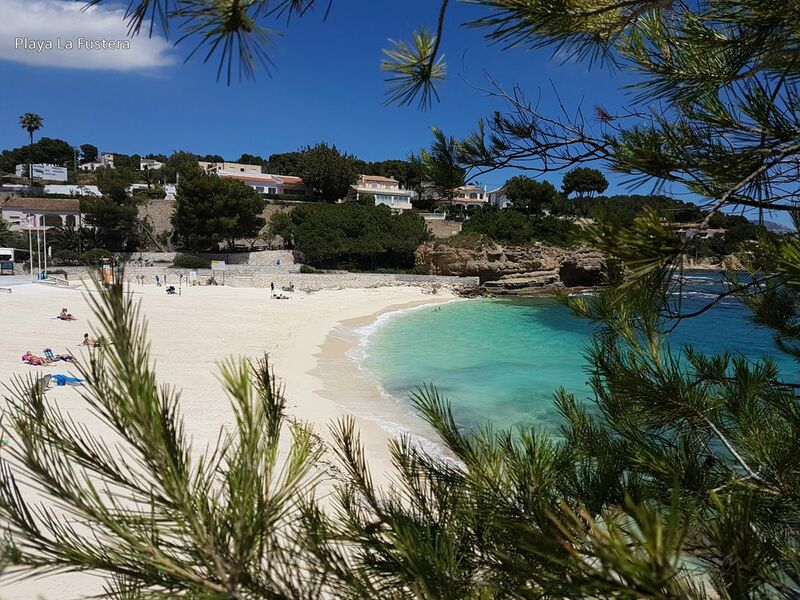 Playa El Portet is a small quiet beach on the east side of the town and Playa L'Ampolla is a very safe family beach on the west side of the town. The beautiful cove of Playa La Fustera can be found 6/7 kms to the west on the road to Calpe. For those not wanting to spend all their time on the beach there are many places to visit locally. Calpe, Altea (Altea old town is very spanish with its narrow cobbled streets) and Javea to name just a few. Moraira is located 1 hour away from Alicante airport. Beach / Pool towels are not provided. Please bring your own. Spanish TV plus limited package of UK SKY TV. Card swipe access. Wrist bands to be worn at all times. My wife and I enjoyed a pleasant 2 week stay in this apartment and would be happy to recommend it to other couples. The photographs online accurately depict the property and it’s both furnished and equipped to a good standard. With it being a one bedroom property, it’s ideally suited to a single person or a couple. All appliances worked well and the instructions left by the owners were clear and concise. With the one small issue that did arise, the owners responded to our email query within 2 hours and resolved the issue. The apartment is around a 15 minute walk to Casa Lily (highly recommended Asian restaurant) around 40 minutes walk to Moraira and a 6 minute walk to the nearest Mercadona supermarket. All told, a good stay and we’d be happy to return. Nice apartment with lovely views and close to Moraira. Thoroughly enjoyed our stay at your lovely apartment Christine. Location and entry instructions were spot on. As we spent most days out and about with my sister and at her villa up on Cumbre we only really used the apartment for sleeping and for breakfasts but all facilities were excellent and the bed was ever so comfortable, so much so that we have decided to upgrade our mattress at home. The aircon/heating unit was very good and heated the living room and also the bedroom.Two minor points, on the photo of the breakfast bar it shows two stools but there were non in the apartment so we had to bring in the plastic table & chairs from the balcony. The other minor point was that, although there were two bath towels, there was only one face towel. It wasn't a big problem as we did bring a couple with us. All in all we would definitely return and recommend this apartment for anyone wishing to visit Moraira or even Javea. The property is well situated as it's a couple of miles out of town, which we prefer. The development is very pleasant, and the large swimming pool is a big attraction for us. The apartment itself is well finished, with lots of little details that make it pleasing to stay in. The owner responds quickly if required. We have been going to Moraira for years, as it's such a lovely area to visit, and this apartment worked perfectly for us. The apartment is really nice and clean. The terrace is quite big and offers reat views from the sea to the mountains in the back country of Costa Blanca. The Bed is a bit unstable but that was no Problem. The nice open kitchen has everything you need to make breakfast or cook an easy dinner. But a bigger pot and pan would be good. The Bathroom is quite big with a big shower. There are different supermarkets and restaurants arround and also the next town Moraira and the beach aren't very far. But it's good to have a car though. Unfortunately the washing mashine and dish washer were not working when we were there, but Christine told us that before our arrival and refunded us some money for that inconveniences which was very nice. All in all we had a wonderful stay there and a relaxing holiday. Dear Christoph. I am really pleased that you had a good time here and thank you for your kind review. I am now here on my holiday and can inform you that we have done a full clean as I was not impressed with the cleaning done by the cleaning company. We have also replaced washing machine and fixed the dishwasher. The bed will be replaced soon so should you ever wish to return and stay in the apartment again it will be more comfortable and you would be more than welcome.